‘Second Letter to the Lay Priest Yadoya’. However, he has not been heard from since. What is the Shogunate doing? The crisis approaches. Four months after it, August 21, Nichiren sent the similar writing to Mitsunori Yadoya of the lay priest who was the shogunate vassal. He had ever relayed the 'Treatise of Establishing the Correct Teachings for the Safety of the Nation'. However, there is not an answer. 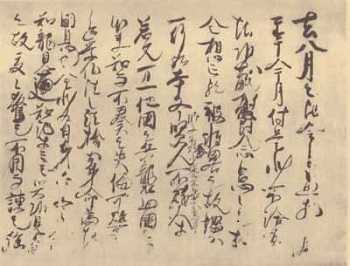 Nichiren sent letters to Shogunate vassals lively and reported an opinion in detail since a document of Mongolia came. Mitsunori was the one in that group. There is no reply to his question, too. He write down the resentment in the beginning. “I have not received any letters from you since we were in touch last, I doubt you indeed. Formerly, in the first year of the Shoka era , on the twenty-third day of the eighth month, when the hour of the dog gives way to the hour of the boar [around 9:00 p.m.], there was a great earthquake. I, Nichiren, considering various sutras as to why this happened, concluded that, because people put their faiths in the teachings of the Nembutsu sect or the Zen or other sects, the great various benevolent deities who protect this nation of Japan have become angry and have brought about this disaster. If steps are not taken to remedy the situation, this nation will be overthrown by a foreign nation. I wrote a treatise expressing these views and, in the second year of the Shogen era , on the sixteenth day of the seventh month, I sent it to you, requesting that it be forwarded to the lay priest of Saimyo-ji of deceased now. Since then, nine years have passed. I hear reports that this year a document from the great Mongol Empire has been sent to Japan. If the texts of the sutras are to be believed, our country will inevitably be attacked by that nation. I, Nichiren, am convinced that, throughout the country of Japan, I am the only person who can subdue these barbarians of the west, and I have written a treatise explaining my reasons. For the sake of the ruler, for the sake of the nation, for the sake of the gods, and for the sake of Buddha, I ask that you forward my views to the regent [Hojo Tokimune] privately. I shall tell you all about the matter when I have the pleasure of seeing you. The twenty-first day of the eighth month in the fifth year of Bun'ei . To the lay priest Yadoya Saemon”. ‘Letter to the Lay Priest Yadoya’. But, contrary to expectation, Yadoya is not going to meet Nichiren at all. He has not once been heard from. How should this be interpreted? Are they not only blind to Buddha's Law, but also insensitive to a crisis of the nation? September of after a month. Nichiren sent a letter to Yadoya with stronger contents again. If one did not inform this to a lord and left this as it is as the bureaucrat, one is punished to a lord in some cases. “Around August, after having sent a letter to you, I am not receiving an answer about right or wrong to this month either, so I cannot clear the melancholy. As you are busy, are you forgetting it? Because you downplay this, do you not take an action? The sutra says, ‘the lion is not afraid of a big elephant without making light of a small rabbit’. The fault to know it, and not to report to a ruler falls on you entirely if the soldier of other countries attacked this country by any chance. The reason to learn Law of Buddha is to abandon life, and to repay to the affection of the country. It is not for the sake of myself at all. The sutra says, "You watch rain and understand the dragon, and watch a lotus and should understand the pond". Because a crisis is sudden, I am surprising everybody many times. Though this is not used, I remonstrate, besides. Strong …”. ‘Second Letter to the Lay Priest Yadoya’. The existing writing ends here. Resentment of Nichiren is appearing obediently. There was not the reaction of the Shogunate at all afterwards either. The appeal of Nichiren does not reach the regent. Because it was said that by Tokimune,"It did not have anything to do with this", it was abandoned, or it was clear to have been hushed up in darkness by hand of the Shogunate chief vassal. Continued to 20. Nichiren Addresses the Warning to Hojo Tokimune.